Information: Mary Effie Shambaugh, author of books about folk dance. 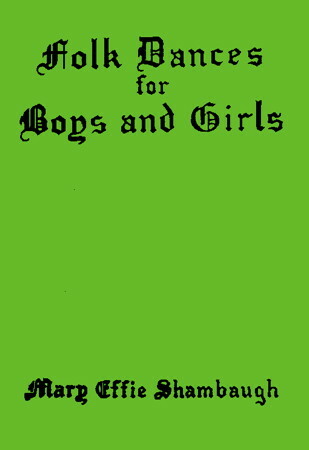 Folk Dances for Boys and Girls. Shambaugh, Mary Effie. New York: Barnes, 1929, 1939. (1929: OCLC 1327132, 793.31 FAL; 1939: OCLC 6601130). Excellent Ukrainian, Czech and Austrian dances. Folk Festivals for Schools and Playgrounds. Shambaugh, Mary Effie. New York: Barnes, 1932, 1936. (1932: OCLC 332066, 793.31 FAL; 1936: OCLC 4419948). Devojačko Kolo. The Place of Folk Dancing in a Program of Physical Education for Elementary and Secondary Schools. M.A. thesis, Shambaugh, Mary Effie. University of Southern California, 1929.